An Arabian proverb warns "Do not cut down the tree that gives you shade"-- which makes perfect sense, unless you're cutting down the tree to give yourself shades -- ohhh, where's your concept of zero now?? 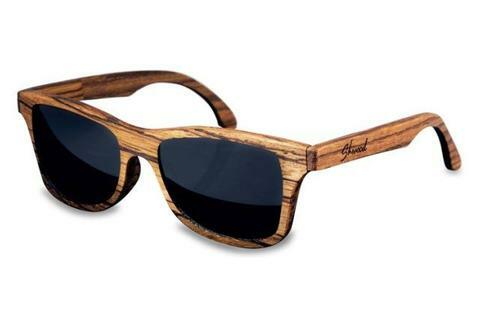 Defying old Persian dudes to bring you awesome sunglasses: Shwood. Just into DC's Commonwealth, Shwood's a Portland-based purveyor of handsomely handmade, all-wood-framed shades, which currently gets its lumber shipped in from sustainably-harvested operations in Africa, but whose prototypes were whittled from tree branches snipped from neighbors' yards, a source which proved unsustainable when said neighbor bought a shotgun. Frames start off as blocks of either "bone-colored" European Maple, "chocolaty brown" East Indian Rosewood, or strikingly grainy Zebrawood, which're laser-cut before being glued together with contrasting grain directions (for added strength), hand-sanded, and finally, made water-resistant via a coat of natural beeswax, none of which is yours, buster! Steezes (customizable with type of wood and choice of Italian-imported Carl Ziess lenses) include the hip Canby, a Wayfarer-ish number with slightly thinner and straighter arms, and the boxier Govy, which features a bigger, more angular frame that's "better for larger faces" -- perfect, as Eric Stoltz's birthday is right around the corner. All styles/woods're also available with a selection of variously-tinted polarized lenses, which reduce glare, but not down to zero -- you lose again, Arabia!